Christmas in the Smokies 2009 is officially over. I had a great time hanging out with the family and even snuck out for a few hours of fishing but all good things must come to an end. The park streams were tough to fish most of the time due to very high water but I still managed to find fish. Sometime in the next day or so I plan on getting a complete report up, but in the meantime, here's a picture of Little River at Elkmont from Christmas day. Recently stocked rainbow trout are generally not the first thing I think of when I want to go fishing. In fact, they are probably towards the bottom of the list...most of the time. However, when the cold arrives for winter, it is nice to go somewhere close and just catch a few fish. Here in Tennessee, TWRA has a special winter put and take stocking program that provides trout fishing options for people in places where they normally wouldn't be able to catch trout. The fish are definitely not large but still a lot of fun. Starting tomorrow I'll be in the Smokies for a few days. I'll get at least a little fishing in so hopefully I can catch some larger fish while I'm over there. 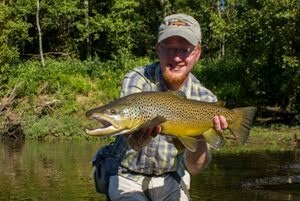 My buddy Joe Mcgroom caught a nice brown recently so there are fish to be caught if you put in your time. This past week has been total madness. Administering and grading final exams is definitely not very high on my list of most enjoyable activities. In fact it didn't even make the list. It has been two weeks since I was last able to fish, and I'm starting to feel withdrawal symptoms coming on. This weekend will include exactly zero fishing, but next week things will start improving. My family will be staying in the Smokies for three nights including Christmas, and naturally I can't be that close to the Park without doing a little fishing. This time of year can be quite fickle if you are interested in actually catching fish but it is far from impossible. Even on the coldest days you can often find rising fish if you put in enough time looking for them. My buddy Joe Mcgroom has been doing well on better than average browns with some new techniques so hopefully I'll be able to meet him to chase some monsters. I intend to devote this winter to fishing the Park. I had already made this decision a few months back, but the relentless rain has made it the logical choice. The area tailwaters are all blown out and look to stay that way for the foreseeable future. Right now, the only thing holding back full blown withdrawal symptoms has been the memory of yet another first, and 2009 has definitely been the year of firsts. The most recent was my first walleye. My secret striper spot has now yielded up many different species from trout, to stripers, and now the walleye and seemingly everything in between. I was quite pleased to catch the walleye, especially since it was caught by sight casting (my favorite way to catch fish!!!). Apparently my shad pattern works on fish other than stripers and that's a good thing. This next week I hope to finally get up the promised pictures of this pattern along with lots of other goodies. With a little luck, I'll have some great fish tales to tell in another week or two as well!!! Fisherman are habitual liars and that is part of what makes our sport fun. Large fish always seem to grow even larger with each telling of how they were caught. There's nothing like a big fish to generate a good fish story. How often have you been telling a buddy about catching a big fish complete with pictures only to have them doubt that the fish is really as large as you claim? Many people are just too polite to do such a thing, but others can be downright ornery about it. Not too long ago I found the perfect solution to this problem. A few months ago, I was making a routine stop by Little River Outfitters when Daniel Drake told me he had something for me to try out. Upon returning from the back of the store, he handed me a device called the Handi-Measure. I had seen pictures of the product before but never actually tried one. Basically it is a tape measure that attaches to your net. When you catch the fish, you can simply pull out the tape while cradling the fish in the net and get a measurement. Since Daniel gave it to me, I have found myself using it more and more when I want to know the length of a fish. To me, it is a lot easier than carrying a measuring tape in a vest pocket and having to rummage around for it while the fish is wondering what just happened. If you have been looking for a good way to measure your fish quickly and efficiently, I would highly recommend that you check out the Handi-Measure. Initially I did not plan to fish this past weekend, but when David Perry from Southeastern Fly emailed me to see if I wanted to float, I couldn't refuse. Recent reports coming from the river have been distressing, and we both wanted to see what the situation really was. When Sunday morning donned cloudy, my expectations immediately went up. I was hoping to find some big browns willing to chase streamers. By the time I got to the river to meet David, the clouds were starting to think. By the time we made it up to the dam to launch, the clouds were giving way to sunshine. Still, we were excited about the potential for the day. To get things started, we headed up to the base of the dam and looked for big fish feeding. After checking the sluice (and finding it a bit dirty), we finally headed down into the main river channel to start floating. As we worked our way down the river, I noticed that others were catching fish which was a good sign. We both had fish within a reasonable amount of time although it wasn't on fire either. As we continued on down the river, we found plenty of rising fish, but in general there was no consistency at all to their rises. When I find a fish that rises consistently, I will stop and fish for it. We did this for a couple of fish, but I was too lazy to tie on the tiny midge dries that worked well for me last time I was on the river. I took over rowing duty for awhile and watched as David worked the water with his indicator rig. We were seeing a few fish but just not as many as what should be expected. After he caught a few, we switched places again. Just as I was starting to get concerned about the lack of larger fish, we discovered a large pod of risers with some better heads showing each time the fish rose. A big head almost always indicates a larger fish. I cast my nymphs and indicator just upstream of the risers and watched as the indicator twitched and then slowly pulled under. The hookset attached me to a bulldogging brown that made several hard runs. Finally I brought the fish close enough for David to get the net under it. He handed me the net, and I was admiring a nice 18 inch female brown. After a couple of quick pictures, I gently held the fish in the current and then watched it bolt back into the depths. We continued down into a favorite spot of mine where I missed a good fish the last time I was on the river. I wanted to work the water carefully to try and stick the big fish, but things just didn't work out. We continued on down the river and shortly I saw the indicator dive again. The next fish was almost as large as the previous one and was definitely fatter. For the rest of the afternoon, we continued down the river, taking turns at the oars while the other fished. As darkness fell, we still had aways to go to reach the takeout. 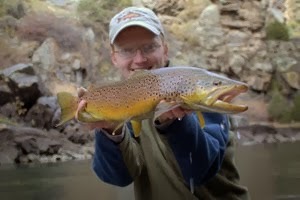 I decided to go back to the streamer rod and see if I could find a good fish willing to eat something big. My efforts were rewarded with a couple of quick hits but the fish were just not committing enough. 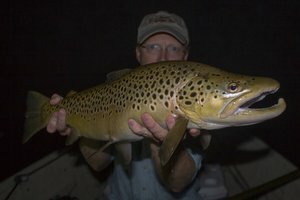 Finally, as I was swimming the fly back towards the boat, I felt a solid hit and soon boated the last brown of the day. The fish was right around 16 inches and fat! Overall, I was encouraged with the results of our scouting expedition. My main goal on this trip was to just see what was happening on the river, and that goal was exceeded by catching some very nice browns. The numbers were lacking, but I'll take quality over quantity whenever I fish. I want to thank David Perry for a nice day on the river. He is an excellent fisherman and guide, and I learned a lot throughout the day. The Smokies call my name year round, but my favorite time to go is the fall. The leaves are gone now and the streams are cooling down, but it is still the perfect time to go. My cousin Nathan and I had been planning a camping trip during Thanksgiving break for a couple of months. As the time approached, we decided to cut the trip down to just one night because the forecast was not ideal. We made the drive up on Monday, stopping by Little River Outfitters as usual to say hi to everyone and allow Nathan to pick up a fishing license. I also wanted to give Byron one of the streamers that I've been catching all my stripers on so he can try it out on some of the lakes he fishes. After stopping at the shop, we drove on towards Elkmont. I wanted to check a couple of spots for big fish and was amazed to find a monster at the first place we checked. Luck was not on my side and after fishing for it awhile, the big fish spooked. After trying for the big fish it was time to get a campsite. There were more people at Elkmont than I expected, but there were still lots of empty sites. We set up the tent and spent a little time foraging for firewood. A big fire was perfect for the chilly night in the mountains and we spent the evening sitting around the fire. I had planned on getting up early to stalk big fish but was feeling kind of lazy when I woke up. Instead we lazied around the campsite and cooked up a big breakfast before heading out to fish. The destination for the day was the Middle Prong of the Little Pigeon. We wanted to hike a short distance up the Ramsey Cascades trail and drop into the gorge section for rainbows and brookies. The day had started out with plenty of sunshine, but as we got closer to the trailhead the clouds thickened. When we started up the trail, the sun was completely obscured by the clouds. In general I like cloudy days better, but in the cold months I prefer sunny days. The water temperature never came up at all, but the 47 degree temperature was not too bad. The fish still eat just fine in the colder water but are concentrated in softer water. This seems to be the case now as all the fish we caught came from the pools and slower runs instead of pocket water. For the next few months it will be important to focus on these types of water to find success. I had been hoping to fish dries but most of our fish came on nymphs. The two best patterns were a Prince Nymph and a Tellico nymph. Both Nathan and I were fishing tandem rigs with other patterns but these two were easily the best producers. There were a few little dark stoneflies flying about and a stray caddis or two but that was it. I did coax a few fish to a stimulator in the slower water, but in general they just weren't interested in rising. A couple of months ago I was contacted by the folks at Overshoes Online about reviewing one of their products, the NEOS River Trekker Overshoe. The River Trekker is a hip wader that is designed to be worn over your regular footwear. I have been waiting for the opportunity to try these out on a tailwater before writing a review. The Caney has finally been fishable recently so now I have tested them on all the water types I fish. My first impression of the River Trekker was a bit skeptical. This was because I couldn't believe that a shoe worn over your regular shoe could actually be comfortable. As it turns it, the exact opposite is true. As soon as I tried them on I was impressed with how comfortable they were, and I didn't feel like I was walking on top of a platform. The best thing about them is how fast you can get them on and take them off. These are perfect for several things including as a quick backup pair of waders that you keep in the car for those rare opportunities when you want to fish but don't have all your gear with you. My chief complaints about the River Trekker are that it is only a hip wader and that the rubber soles don't grip well on mountain freestone streams. The first part is just a personal preference. I am a very aggressive wader and prefer chest high waders instead of hip waders. I am definitely limited about where I can wade if I am only wearing hip waders. The other complaint is that I wish they had a felt sole. The Vibram sole works great on smaller rocks and gravel and makes these perfect on the tailwaters. However, on larger rocks in mountain streams, I just didn't feel safe. The rubber sole just does not grip the slick rocks as well as I would have liked. To be fair, I still haven't tried on any rubber soled boots that I feel are as good as felt. As far as rubber soled wading boots go, the River Trekker is probably as good as any other. These hip waders have a couple of great applications. The first is for anyone that has a drift boat or other type of boat but doesn't want to wear waders throughout the whole float. The ease with which the River Trekkers can be put on or taken off makes them ideal for those times when you need to get out of the boat in the shallows such as launching or taking out or stopping for that shore lunch. They are also great for wading small creeks that don't have lots of larger rocks. As long as the bottom is gravel, silt, sand, or even mud you will be fine. Shallow tailwaters are also ideal for using the River Trekkers. They will work even on a river like the Caney Fork, but you will be limited on the water you can access. For certain applications, these are a great wading product. I can't really recommend them as your primary wading gear unless your wading is mainly on the water types that I mentioned as being ideally suited for them. I think that the addition of a felt sole and maybe also making these as a chest high wader would make them better, but as they are, they do have some great uses. The latest poll here at the Trout Zone was on the topic of world record fish. I have often wondered what I would do if I caught a fish that was most likely a record. Probably I would release the fish without even thinking about it but then again, big fish make people do strange things. Of course I would take pictures before releasing the fish. In the poll, the vast majority of you said that you would take pictures and measurements and then release the fish. A few wouldn't even do that which is interesting. I must admit that I am excited enough about catching big fish that I always want a picture. Even if it isn't a large fish I often take a picture. Trout are such beautiful fish that I like to take as many pictures as possible to help me remember each of my days on the water. Anyway, thanks for your input on the poll and watch for the next one coming soon! Any day fishing is satisfying, but some are more so than others. Today was the first day of low water on my favorite river in a long time. The masses already know that the water is off and there were plenty of people on the water. Thankfully I was still able to find places to fish. My first stop was enough to get me excited. I hooked and landed an 18 inch fish within the first 5 minutes of fishing a deep run. Unfortunately, this quick start did not lead to a spectacular day of catching fish. I checked several other spots that I always enjoy fishing and finally ended up at my favorite spot. Rarely do I make a trip to the river without stopping there and today was no exception. I fished for awhile and was thinking about leaving. About that time another fly fisher stopped by to chat and asked if I had a stream thermometer. I did indeed and while I checked the water temp, we chatted about fishing and bamboo fly rods. After determining the water temperature to be 59 degrees, I started back up the river. Suddenly I saw a rise...and then another...and a few minutes later another. Three rises is definitely not very many but enough to convince me to try a dry/dropper. My first fish came to a zebra midge so I dropped that beneath a Parachute Adams. Moving upstream, I began stalking a nice riser. The brown would rise leisurely but regularly. Instead of spooking when I put my flies over it, the fish just slowly worked its way up the river. I kept following for around 50 feet and finally I stopped to carefully observe the fish. The next rise convinced me that the fish was taking adults from the surface instead of pupa just beneath or in the film. Out came the box of dries and I searched through my midge selection for one of my favorite patterns from this past summer. Quickly I cut off the zebra midge and then tied on the #22 midge dry. After adding some floatant, I started casting again. 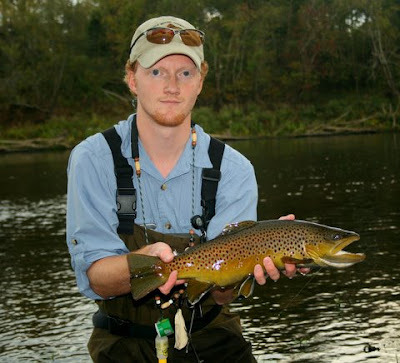 A few casts later my timing coincided with the rise of the fish, and I was attached to a healthy brown. After fighting and landing this 15 inch fish, I took a few moments to enjoy the beauty of the day and savor the satisfaction of solving a difficult fish. Compared to some fish I've caught, I really didn't fish very long for it, only about 30 minutes. However there is very little that is as satisfying as solving a difficult riser, especially when the solution involves a tiny dry fly. I caught a few more fish on the dry. Every fish that rose consistently would eventually eat my midge pattern. Overall it was a great day on the water, and I enjoyed the late day dry fly action. In a couple of days I'm headed to the Smokies for a night or two of camping and of course some fishing. Additionally, I have some other articles that I need to finish and should be up in the next day or two. Check back often during the next week as I should be able to fish quite a bit over the break. This past week, the remains of Hurricane Ida soaked east Tennessee with several inches of rain. Little River rose to nearly 4000 cfs which is a lot of water for such a narrow streambed. Today I went over to the Smokies for a few hours to fish and just spend some time relaxing. A few fish were fooled, a fish big fish spotted, and best of all I spent some time in my favorite place to be. The fish I caught weren't particularly picky and favored a small soft hackle over the smaller BWO nymph that I dropped behind it. If you found a good spot, the fish were stacked in tightly and feeding heavily. I stood in one spot and caught three fish and missed several others. Today was not a good day to spend much time wading because of the high flow. Despite the fact that it has been a few days now since the big rain event, Little River is still flowing at between 600-700 cfs just outside the Park. You could see where the water level had been another 3-4 feet higher at the peak of the high water. Many of the browns that had been spawning were pushed off the redds by the high water and appear to just now be returning. I found several big fish in a new spot that I'll have to keep a close eye on. Sometime this winter I intend to go back and try to catch some of them. Things have been slowing down at my favorite striper spot. These fish are known to move around a lot, but I'm not sure if they are moving because of the cooler weather or some other cause. I've been doing very well on a shad pattern that I will probably share here when I get the time to take some pictures of it. Something else interesting I'm noticing about the fish that I'm still hooking is that they aren't running quite as hard now with the cooler weather. A month ago, they would bolt as soon as they felt the hook but now they are a bit more leisurely about fighting. 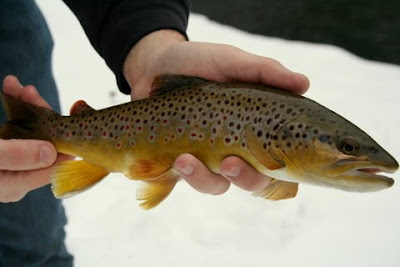 With cooler temperatures comes the annual brown trout spawn. I enjoyed watching a pair of large browns up on gravel last weekend and was able to take a few pictures without spooking them. The larger fish is the male, and the smaller darker fish is the female. Smaller fish nearby were being continually chased off by the big male. It was a blast watching how aggressive it was, and I always like to watch these beautiful fish even if I am not fishing for them. Can you find the big browns in each picture? This past weekend I had the opportunity to camp in the Smokies at Elkmont for a couple of nights. It was a trip that I had been planning for awhile, and I was excited for the chance to get back to my favorite streams. As the time to leave approached, I noticed that the weather forecast was a concern. However, like the dedicated outdoorsman I try to be, I decided to go anyway. My buddy Joe was supposed to meet me for the first night of camping and we were going to fish all day together. Upon arrival in the Park, I found Joe stalking a good brown which is what I normally expect to find him doing. He showed me where a monster had been sitting before it spooked and then we headed up towards Elkmont. Joe was going to keep fishing while I checked in to our campsite. After leaving a chair and the little paper to show that our site was occupied, I went looking for Joe again. Naturally he was looking for more good fish but hadn't found any yet. I decided that, due to the late hour, I wasn't going to fish the first evening. Instead, I got my camera to document any good fish that Joe might happen to catch. Walking the bank, we found another good fish but spooked it before Joe could even get a cast on it. At this point we decided to head back to camp for the night since it was getting dark. We stopped at the Crusher Pool on the way back and met a couple of guys from the Murfreesboro area that had been fishing. We swapped fishing stories for awhile and talked about the Caney Fork. Area fishermen are really excited about the regulation changes that will be enacted on the Caney in 2010. This river can support tremendous numbers of quality fish if the new regulations can be sufficiently enforced. After checking the Crusher for big fish, we continued on up to Elkmont and set up camp. After sitting out enjoying the campfire for a few hours, we both decided that it was a good idea to get some rest before the next day of fishing arrived. Day two was tough. There is no other way to describe it. The rain was falling in earnest when we woke up. Joe was the tough one and went fishing while I decided to snooze a little longer. Finally he came back excited because he had found some good fish, and I rolled out of the warm sleeping bag. We fished several places during the day covering a large portion of the Little River. In all places we found fish feeding but the increasing number of leaves in the water and the rising water levels made catching them tough. Nymphs were at best very difficult to fish but I managed to fool a few fish on a BWO parachute. Finally the conditions were just too tough and we both decided to quit fishing for the day. Joe headed home for the night and I spent awhile trying to decide whether to pack everything up and head home as well. In the end, I decided to stay which turned out to not be such a great idea. This week, I came down with the flu and have spent the last couple of days feeling quite miserable. I'll blame it on a combination of getting too cold and wet and eating way to much sugar over the weekend. Still, it was a great trip. The catching wasn't as good as I had hoped but if that was the only reason I go fishing, I would probably plan my trips around peak feeding times. The fall colors were nice and I had the chance to at least see some really quality fish. Strangely, I never really took any pictures which was mostly because of the rain. I'm not about to get my good camera out in bad weather. After last weekend's striper mania, the only fitting encore was to return for more. I had a few hours free Saturday night and decided to head back for more punishment. Joining me in pursuit of the large stripers would be my buddy Joe Mcgroom who finally agreed to come see what all the hoopla was all about. I made it down to my fishing hole ahead of him and as it is a bit remote, he had a hard time figuring out how to get there. Hoping to catch a couple before he arrived, I strung up the rod and went to work chucking big nasty flies. Shortly after starting, I hooked a monster that would easily have been the largest I've landed yet. Unfortunately it somehow managed to throw the hook after a blistering run that had the drag on my Lamson screaming. Where there's one there must be more so I started working the water again. Soon another fish was on. After a hard-fought battle, the fish finally agreed to be corralled and I got a quick picture. Finally Joe showed up and I demonstrated to him the proper technique and showed him where a fish should be. Then something incredible happened. On his first fishing trip for stripers, he hooked into a really nice fish. Neither of us saw the fish but the bend in his rod and the screaming reel were evidence enough. Several hard runs later, the fish finally began to tire. Joe did an excellent job of not forcing the issue and finally the fish was close enough for me to grab. Putting your hand in the mouth of one of these fish is a bit intimidating. If they happen to clamp down with their jaws it can also be a bit uncomfortable. After lifting the fish out of the water, I passed it off to Joe, and he hoisted his first ever striper for a couple of pictures. I was thrilled to see him hook such an awesome striper on his first trip and amazed at how fast he did it. Joe had been fishing no more than 15 minutes when he hooked the fish. We fished for another hour or two and I landed one more that weighed around 20 pounds, but overall the evening slowed down considerably. This seems to be the normal pattern. You catch or at least hook 4-6 fish in this spot and then it gets quiet for the rest of the time. I won't complain though. The trip is worth it to land just one of these beautiful fish, and I got two. Next weekend I am planning a trip for trout in the mountains of east Tennessee. The weather may be a bit uncooperative, but I am going no matter what. Stripers are a lot of fun, but nothing can beat trout for me at least. In the meantime, I'm still working on a few other things that I hope to be able to share this week. In addition, I am working on an article for the Little River Journal from Little River Outfitters (you have to sign up to receive it by email). Of course, in between all this I need to actually teach some classes as well so I'll be busy this week for sure! All good fly fishermen spend an inordinate amount of time dreaming about their sport. Perhaps it is mindlessly gazing out the window on the first nice day of spring while you are at work, or maybe it is getting the shakes on a cloudy, drizzly day in the fall because you aren’t out chasing the big browns that you know are on the move. Regardless, time on the water is normally somewhat difficult to come by for most fishermen. Unless you are a guide or independently wealthy, most people just can’t afford to fish all the time. In between fishing trips I normally pull out maps, look at pictures form past trips, and tie plenty of flies in hopes that maybe one of them will be the magic fly to entice a monster brown or chunky rainbow. Rarely does my time on the water reach the point of ridiculousness that causes me to just stand and laugh as large fish line up for the opportunity to be caught. Naturally, many of my day dreams about fly fishing involve large fish, and occasionally nightmares as well. There is always the big one that got away to think about. A few months ago, I started dreaming about my fall break. Every year I try to do a camping trip to chase trout somewhere or another. Traditionally this trip has been to the nearest mountains that have trout. Several of these trips were to the Smokies over the last few years, and I always love going to the place where my fly fishing career started and my skills developed. This year I wanted to do something a little bit different. I started planning a trip to the Cumberland River in Kentucky well in advance, making reservations to camp there, and inviting others to join my buddy Trevor and me. Unfortunately, as the time of departure approached, unseasonal heavy rain began pounding the region. All the area tailwaters with the exception of those in extremely upper east Tennessee were running large quantities of water. Since we didn’t have a boat, plan B started to sound good. I cancelled the reservation at the campground and started thinking about returning to the Smokies after all. The rains continued though and instead of camping in the wet weather with unusually high streams to fish, I decided to just stay home and do day trips wherever the best conditions were each day. My first couple of days went well, but I felt that I should have much better fishing. Day three is when things took an abrupt turn for the extraordinary. Trevor and I had decided to make the drive over to Cherokee to fish the tribal catch and release water where we hoped to tangle with some monster rainbows. The trip turned out well but we really didn’t catch as many big fish as we had hoped for. The water was really high for that area and we did best on up the Raven Fork. As daylight started fading, we decided to call it a day. The drive over the ridge is better if done while it is still light out. Since it wasn’t too far out of the way, I decided to check on a couple of striper spots as I headed back to Crossville. When I arrived at the first one, I was amazed to see big fish stacked up near the bank. Since I had only caught 3-8 pound fish up until this point, I probably should mention that big fish doesn’t mean 50-60 pound fish. I ran back to the car and feverishly started putting my 7 weight together, calling Trevor at the same time. He could hear the seriousness in my voice as I told him about the monster fish there. “I’m on my way” he said and I returned to fish. There was no one else out on the water, no one at all to see the big fish rolling on the surface and darting around like shadows just under. In no time at all I was hooked up with the biggest fish of my life and learned what it is like to worry about your backing knot. When I hooked the fish, I had maybe 20 feet of fly line out. It took no more than 3 seconds to see my backing racing through the guides and probably another second before my heart started pounding. The rest of that night is a bit hazy, kind of like a good dream where you wake up and everything seems so real and yet so distant. I do remember that the first fish threw my fly while the next broke my off. Eventually I started landing fish. Trevor showed up and both of us caught stripers over 20 pounds according to the boga. Both of us got cleaned out a few times as well. These fish are insane when hooked and head for the far reaches of the earth in their efforts to throw the fly. Occasionally I would just burst out laughing at how ridiculous the whole situation was. We were there alone with more monster stripers than we could possibly hook in a night, and the fish were just so big. After making my usual stop at Little River Outfitters, I headed on up Little River Road, stopping often to check favorite holes. Finally, I got tired of looking for fish and just decided to cover some water. Catching large fish usually works best when you find them first but you can catch them by just fishing the water blind as well. As I moved up the stream, I had several small rainbows attack my flies. Then, as I started into a run that has held big fish in the past, my line stopped abruptly. I set the hook and was attached to a nice brown, at least for the park. If I was fishing a tailwater the fish would only be average, but in the park, anything over twelve inches is a decent fish. Best of all, the fish was brilliantly colored. These fish are so beautiful, I am always thankful that I get to see them up close for just a few moments. Later in the day I caught a fairly nice rainbow and missed another good fish. This trip was just a warmup, and I fully intend to spend several days in the upcoming weeks in search of the elusive big brown trout of the Smoky Mountains. My official "Favorite Time of the Year" is back but in a strange way. The past two years have produced near perfect conditions on the tailwaters for fall fishing. 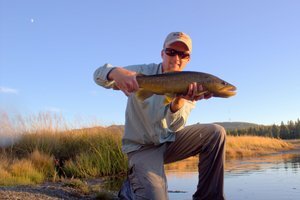 Largely due to the drought, the low flows were idea for wade fishing and produced many good sight fishing opportunities for large browns feeding in the shallows. This year has been the exact opposite. We have recovered from the drought but payed for it with difficult conditions on the tailwaters. Originally I planned to do a multi-day camping trip on the Cumberland River this October. After the success I had last year, I couldn't wait to get back and chase some more big browns. Unfortunately, it appears that I will have to cancel my camping reservations and the trip. The flows are up and look to stay that way for at least another couple of weeks. The same thing goes for the Caney Fork and Clinch Rivers. 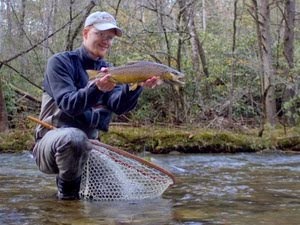 The only tailwaters in the area with a shot at good wading conditions are the upper east Tennessee rivers. Despite the tough tailwater conditions, the mountain freestone streams are all in peak condition. Recent high water cleaned out the streams and knocked down the rock dams thrown up by the tourist tubers. Water levels are high for this time of the year making for interesting fishing conditions. The fish are also healthier than they have been in some time. There is plenty of food in the streams and the fish have been eating well all summer. There are also some sleeper streams that no one knows about. They are definitely hit or miss, but if things turn out well, the hit will go for a home run. As much as I enjoy fishing the mountains, I love fishing the tailwaters as well. Hopefully we won't get too much more rain. Right now I would say we are looking at about two weeks until the lakes drop enough to provide some fishable windows on the tailwaters. Any significant rain event will push that back further. In the meantime, I'll be putting in a lot of time at the vise, tying flies for the cold months. Months have passed since the last poll here at the Trout Zone. Yesterday I had the opportunity to float with my buddy Joe Mcgroom. At one point, I asked him what he would do if he caught a possible record brown. Without even having to think, he immediately replied that he would release the fish after a quick picture. How many people would be able to do that? I have often wondered what I would do if I caught a huge fish. I hope that I'll be able to let the fish go without having second thoughts. Personally I would hate to kill such a magnificent fish. If I have a memory then I'm happy, and if I have a picture, it is even better. So, what would each of you do with a possible record? Vote in the poll on the right hand side of the page and let me know! ...and caught a few fish. Here is the best fish of the day. Thanks to Joe Mcgroom for taking the picture! Lately I've been extremely busy and have been struggling to find the time to post anything. I apologize for the lack of new material and hope to do better moving forward. Hopefully I'll have a few more fishing reports to tell about in the near future. Last weekend I did manage to get some camping in down at Chilhowee near the Ocoee and Hiwassee Rivers. Squeezing in a little fishing was challenging but I managed to catch a few bluegill and bass from the little lake on top of the mountain. The weekend involved some of the heaviest September rain ever in east Tennessee and made for challenging camping conditions. The Hiwassee was higher than I have ever seen it and area creeks were well out of their banks. I was camping with a group of guys we had taken from the school I teach at. On Saturday we wanted to take them all up to see the powerhouse on the Hiwassee but ran into trouble at Childers Creek. The road was completely flooded up to just over my knees in places. We backtracked and tried the back way in but ran into a mudslide just over the ridge coming down to the Big Bend parking lot. At that point we just gave up. The scenery was spectacular and I enjoyed the opportunity to do a little photography. The sunset on Chilhowee Mountain was beautiful Saturday night. Sunday I ran up to Townsend to pick up a few items at Little River Outfitters. All the streams in the park where high to very high and made fishing sketchy at best. I ripped streamers for a little while but only flashed a few small fish. Next weekend I hope to float somewhere and rip streamers for big browns. Hopefully the weather will cooperate. Tailwater fishing is going to be difficult at best for the next couple of weeks due to the recent heavy rain event. Here are a few of the pictures I took last weekend including some of the high water. The high water pictures are in the vicinity of Reliance Fly and Tackle including a shot looking down the road at the bridge over Childers Creek (last picture).